Have you ever wanted to run a 5k but didn’t know where to start? 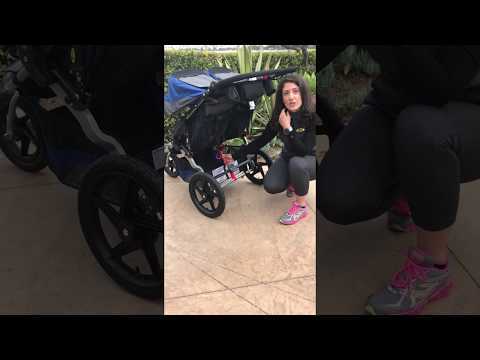 Did you ever wish you had an Olympian to personally train you to get you race ready using your stroller? BOB is here to help! BOB Gear has teamed up with Olympian and super-mom Alysia Montaño for a 5 week virtual training program leading up to the San Francisco Marathon on July 23rd! Alysia is an accomplished American middle-distance runner, a 7 time US champion, with gold medals from the Pan American Games and the World Relay Championship, but she is perhaps best known for her courageous performance at the 2014 U.S. Track and Field Championship where she competed 34 weeks pregnant (with her signature flower in her hair!). Ever since then, she has been an inspiration to mothers around the world. Her strength, experience, and sense of humor make her the perfect coach for our fans and the parents of Team BOB racing in the San Francisco Marathon’s 5k race! Over the next few weeks, Alysia will be offering coaching tips on running techniques, stretching advice, fuel packed recipes for the entire family, strength building and how to reach your 5K goal. It all leads to the San Francisco Marathon 5K on July 23rd! You can follow our #BOBTeamSF parents from the time they start training to the moment they push their BOB across the finish line. Follow our Instagram and check out the hashtag #BOBTeamSF to stay in the loop of the latest posts. Be sure to join us on race day to cheer on our team as they cross the finish line! And stay tuned over the next five weeks for chances to win one of five BOB 2016 REVOLUTION FLEX jogging strollers. Follow us on Facebook and Instagram for stroller running tips and your chance to win! The “BOB LUNAR” SWEEPSTAKES (“Sweepstakes”) starts at 12:00 PM Pacific Time (“ET”) on Friday, July 14, 2017 through Sunday, July 16, 2017 and ends at 11:59 PM (ET) (“Entry Period”). The sponsor of this Sweepstakes is Britax Child Safety, Inc., 4140 Pleasant Road, Fort Mill, SC 29708 (“Sponsor”). The Sweepstakes shall be subject to these Official Rules, and by entering, all participants agree to be bound by the terms and conditions herein and the decisions of the Sponsor, including the interpretation of these Official Rules and its exercise and discretion, which will be final and binding in all respects. HOW TO ENTER: During the Entry Period users may enter by liking the one (1) designated Instagram post at www.instagram.com/alysiamontano from July 14th – July 16th. Users are allowed one (1) entry. A PRIZE WINNER IS ONLY ELIGIBLE FOR ONE PRIZE. Sponsor reserves the right at its sole discretion to disqualify any individual who tampers or attempts to tamper with the entry process or the operation of the contest or Website; violates these Official Rules; or acts in an unsportsmanlike or disruptive manner at any time during the Contest, or with the intent to annoy, abuse, threaten or harass any other person. ALL ENTRIES MUST BE RECEIVED BY 11:59 PM (ET) on July 16, 2017. WINNER SELECTION: One (1) winner will be selected by the Sponsor in a random drawing from among all eligible entries on or about Monday, July 17, 2017. A PRIZE WINNER IS ONLY ELIGIBLE FOR ONE PRIZE. Drawings will be made by representatives of the Sponsor. Sponsor’s decisions are and shall be final and binding in all matters relating to this Sweepstakes. Winners will be notified via Instagram and/or Facebook within two (2) business days after the drawing. Winners will be required to respond to such notification within three (3) business days of notification to claim their prize, failure to do so will result in forfeiture and a random drawing for an alternate winner will be made. Winner will be required to execute and return a signed Affirmation of Eligibility and Liability/Publicity Release form within five (5) days of date of receipt (“Affidavit”). If the potential winner is a Canadian resident, that person will be required to correctly answer a mathematical skill-testing question without assistance of any kind, whether electronic, mechanical or otherwise, within a predetermined time period before the prize will be awarded. Failure to respond to the Winner notification as detailed above or return all required forms within the stated time period, or to comply with any other provision herein, may result in the Winner being disqualified and an alternate winner may be selected at Sponsor’s sole discretion. If a prize notification or Prize is returned as undeliverable for any reason, the Prize may be awarded to an alternate winner at Sponsor’s sole discretion. Prize is not transferable, assignable, or redeemable for cash. No substitution for the Prize by the Winner will be allowed. If necessary, due to unavailability of the Prize for any reason, a prize of comparable value will be awarded at the sole discretion of the Sponsor. PRIZES: One (1) winner will receive a BOB Revolution FLEX LUNAR stroller. Approximate Retail Value of $499.99. ALL PRIZES ARE AWARDED “AS IS” AND WITHOUT ANY IMPLIED WARRANTY OF MERCHANTABILITY OR FITNESS FOR A PARTICULAR PURPOSE. Prizes are not redeemable for cash and are non-transferable and no substitution will be made except as provided herein at the Sponsors’ sole discretion. Sponsors reserve the right to substitute the prize for one of equal or greater value if the designated prize should become unavailable for any reason. Winner is responsible for all taxes and fees associated with prize receipt and/or use and will receive an IRS 1099 reflecting the final actual value of the prizes, if applicable. The prizes will be shipped only to addresses in the United States. Odds of winning the prize depend on the number of eligible entries received during the Promotion Period. GOVERNING LAW/LIMITATIONS ON LIABILITY: The Sweepstakes shall be governed by and construed in accordance with the internal laws of the State of South Carolina, without giving effect to any conflict of law rules or provisions that would cause the application of any other state’s laws. Publicity: As a condition to entry into the Sweepstakes, except where prohibited by law and notwithstanding the fact that winner may be required to sign a separate Publicity Release, each entrant by entering and each winner (and parents/legal guardians of any winner who is a minor in his/her state or territory of residence) by accepting the prize grants to Sponsors’ and its agents’ a royalty free license and right to use of winner’s name, likeness, photograph, voice, opinions and/or hometown and state for promotional purposes in any media, worldwide and in perpetuity, without further payment, restriction, notice, review, permission, approval or consideration. DISPUTE RESOLUTION: The parties each agree to finally settle all disputes only through arbitration; provided, however, the Sponsor shall be entitled to seek injunctive or equitable relief in the state and federal courts in South Carolina and any other court with jurisdiction over the parties. In arbitration, there is no judge or jury and review is limited. The arbitrator’s decision and award is final and binding, with limited exceptions, and judgment on the award may be entered in any court with jurisdiction. The parties agree that, except as set forth above, any claim, suit, action or proceeding arising out of or relating to this Sweepstakes shall be resolved solely by binding arbitration before a sole arbitrator under the streamlined Arbitration Rules Procedures of JAMS Inc. (“JAMS”) or any successor to JAMS. In the event JAMS is unwilling or unable to set a hearing date within fourteen (14) days of the filing of a “Demand for Arbitration”, then either party can elect to have the arbitration administered by the American Arbitration Association (“AAA”) or any other mutually agreeable arbitration administration service. If an in-person hearing is required, then it will take place in Chicago, IL, New York City, NY, Los Angeles, CA, Atlanta, GA or Dallas, TX (whichever is closest to entrant’s residence); provided, however, if none of these locations are convenient for the hearing, the parties may mutually agree on an alternative location. The federal or state law that applies to these Official Rules will also apply during the arbitration. Disputes will be arbitrated only on an individual basis and will not be consolidated with any other proceedings that involve any claims or controversy of another party, including any class actions; provided, however, if for any reason any court or arbitrator holds that this restriction is unconscionable or unenforceable, then the agreement to arbitrate doesn’t apply and the dispute must be brought in a court of competent jurisdiction in Fort Mill, South Carolina. Sponsor agrees to pay the administrative and arbitrator’s fees in order to conduct the arbitration (but specifically excluding any travel or other costs of entrant to attend the arbitration hearing). Either party may, notwithstanding this provision, bring qualifying claims in small claims court. WINNER LIST/OFFICIAL RULES REQUEST: For a list of winners, send a self-addressed stamped envelope to: BOB Gear by Britax, BOB Lunar Sweepstakes 4140 Pleasant Road, Fort Mill, SC 29708, USA. Requests for winners’ list must be received no later than three months after the end of the Sweepstakes Period. NOTE: Entry must be made by the entrant him or herself and only directly to the Website listed above. Entries made by any other individual or any entity, and/or originating at any other web site or e-mail address, including, but not limited to, commercial sweepstakes subscription notification and/or entering service sites, will be declared invalid and disqualified for this Sweepstakes. The use of any device or computer software to automate the entry process is prohibited.